Zion Lutheran second and sixth graders led the way Sept. 28 as area children enjoyed the chance to get UPCLOSE with Monarch butterflies at the second Butterflies UPCLOSE event sponsored by Dani’s Dreams Outdoor Education Programs. Directed by Dani’s Dreams Outreach Coordinator Christina Harkleroad, in collaboration with Zion teachers Brenda Kreutz and Susan Seying, the activities were the culmination of several weeks of research, observation and care of Monarchs, donated by Betty Bemis of Backyard Butterflies, from caterpillars to butterflies. Children of all ages were able to observe the butterflies, create crafts, and an edible butterfly life cycle craft, compete in quizzes and listen to the authors of the Butterflies UPCLOSE book produced by in 2015 by 14 then-second graders at Zion Lutheran School. Butterflies UPCLOSE is one of the unique, STEM oriented activities offered by Dani’s Dreams Innovation in Education Corp. If you would like Dani’s Dreams to work with your class, Scout troop, daycare or preschool to create a hands-on Outdoor Education or Language Arts activity, contact, President and CEO Donna Griffin at 317-640-4430 or dgriffins96@gmail.com. Dani’s Dreams Innovation in Education Corp. is all about empowering young people to “Change the World”, and New Palestine High School sophomore Zachary Mitchell is making his commitment a reality. Zachary grew up alongside Dani’s Dreams and now wants to give back by making a lasting impact for families in Hancock County. A Hancock County Scout for nine years, Zachary Mitchell has an Eagle Scout project that will benefit Hancock County residents of all ages and bring families together to share the wonder of nature through his “Dreaming Tree Porch” project. Zachary has raised about $1,200 of the nearly $1,700 project, including a donation from the American Legion, and hopes to get about $500 from the community to be able to put in a paver porch, benches and display tables in front of the Go Green Center at Dani’s Dreams Outdoor Education Center at Zion Lutheran School in New Palestine. Zachary has spent this year fundraising, including a Pancake Breakfast in June at Zion and hopes to begin construction of the “Dreaming Tree Porch” for Hancock County families later this fall. “The project will includes a 12 x 25-foot paver patio, two benches and two plexiglass tables for displays of rocks, insects and other interesting information,” Zachary said. And his project will have a lasting impact on outdoor education and families throughout Hancock County. “I’ve learned through this project how to be a strong leader, help others and to teach them how to use tools – tools for life,” Zachary said. The Go Green Center, funded through a Hancock County Community Foundation Grant in 2012, serves K-8 students in Southern Hancock Schools with STEM and environmental education displays, activities and projects, including fully-functioning solar panels that power the building. “The porch will be an area for student work/collections to be on display and for parents/grandparents and children to walk, rest and spend time together sharing and learning,” Griffin said. Griffin added the new tables will allow Dani’s Dreams to bring out displays and hands-on items that would normally be locked inside the building. Spreading our wings…the journey is just beginning! Dani’s Dreams Memorial Walk/Run once again gave the New Palestine area community a chance to “Spread Their Wings” and support innovative educational projects in Southern Hancock Schools. At the heart of the event is giving children a chance to create, explore and discover this amazing planet we all call home – our common ground. The Dani’s Dreams Walk/Run is also about celebrating the energy, spirit and accomplishments of our young people: Our T-shirt design contest winner, Paige Taylor, and second place winners, Kate Taylor and Danielle Taylor, and our scholarship winner Tara Morey. The youth theme continued with the walk/run winners – Michael Morris (a record 8 out of 9) took the men’s division and Amanda Stewart won the women’s division in a photo finish with Paige Taylor and Emily Adam was a close third. Thanks to all our community sponsors and volunteers who participated and made this special event possible. If you missed the walk/run, you can still purchase a shirt ($10) or donate online at www.danisdreamsoutdooredcenter.com. All proceeds will go to support the Dani’s Dreams Outdoor Education Trail at Sugar Creek Township Park and our Eco Lessons in Southern Hancock classrooms this school year! Dani’s Dreams Innovation in Education Corp. is a 501c3 organization with a mission to provide innovative, hands-on educational projects for grades preschool through 12 and to connect and empower children in their community. Contact President and CEO Donna Griffin at (email) dgriffins96@gmail.com or call 317-640-4430. ‘Spread Your Wings’ and join Dani’s Dreams’ Walk/Run Aug. 6! Join Dani’s Dreams as we “Spread Our Wings” with the 9th annual Dani’s Dreams Memorial Walk/Run Aug. 6, 8 a.m. at New Palestine High School. Proceeds will go to fund the development of the Dani’s Dreams Outdoor Education Trail at Sugar Creek Park and ECOFEST Lessons for Southern Hancock County students. The walk/run is Dani’s Dreams major fundraiser and your registration or donation can give our children a chance to gain valuable reading, writing, science and technology skills and provide paid internships for high school and college students to be leaders in their communities. If you can’t come, you can still donate and receive a T-shirt! Dani’s Dreams Innovation in Education Corp. is now a full-fledged 501c3 tax exempt organization with a mission to provide innovative, hands-on STEM and Literacy education activities for schools and organizations throughout Central Indiana. Want to join our team as we “Change the World”? Contact President and CEO Donna Griffin at dgriffins96@gmail.com or 317-640-4430. Here comes the sun! See solar in action at Dani’s Dreams! The Go Green Discovery Center at Dani’s Dreams Outdoor Education Center at Zion Lutheran School is now solar-powered! Classes, Scouts, Daycares, Preschools and other groups can visit the Go Green Center, learn more about how solar energy works with our Dani’s Dreams video report and create a solar craft! With each membership, one Southern Hancock elementary school could win a $300 grant for the school, and every child gets a free specially designed T-shirt, wristband, certificate, special e-newsmat and loads of fun educational activities for only $25 a year! All proceeds go right back to Southern Hancock schools to support environmental education! Now in the midst of winter, some animals are in a stage called hibernation. This is a state of inactivity where their body temperature decreases and their heartbeat and breathing slow down. Their bodies go through this to conserve energy that the animals spent all fall saving up. During fall time, the animals eat an increased amount of food to increase their overall body fat. This allows them to be insulated and they will use it throughout their hibernation period for energy. Many animals hibernate. Some animals in our area that hibernate are skunks, chipmunks, some squirrels, and some bats. Also, bears hibernate but those are not in our area. They are mainly in mountain regions to our south and east. These animals hibernate to conserve energy in the winter months when food is hard to find. As animals prepare for hibernation, they eat enough food to last them through the upcoming winter months. Their bodies produce special fat tissues around their brain, heart, and lungs to provide extra insulation in those areas. Animals who use lots of energy throughout the winter days, but do not hibernate, become dormant during parts of the day. This is similar to hibernating however instead of sleeping throughout winter, they sleep for a major part of the day in order to conserve energy. Hummingbirds and some small bats are examples of animals that are dormant for parts of winter. During winter you see less squirrels, chipmunks, and skunks, now you know that they’re just in hibernation and once spring rolls around, they’ll be back to their playful ways. In my next column, I will be exploring what germination is as spring time grows closer and the flowers begin to bloom. Check out the Dani’s Dreams Facebook Page to see the Top 10 Coolest Hibernators! Become a Dani’s Dreams Team Member here and find out how to track animals with our winter newsmat! You’ll get a wristband and a certificate, too! Come to ECOFEST, “Spread Your Wings” and enjoy the fun family activities, crafts and snacks on April 15, 4-5:30 at Dani’s Dreams Outdoor Education Center at Zion Lutheran School. Dani’s Dreams Outdoor Education Center is joining forces with the Sugar Creek Township Park Board, New Palestine High School teacher Brittany Bennett and her AP Environmental Science class and Donna Rogler, Indiana DNR Project Learning Tree specialist, to develop a second education trail/activities for Southern Hancock students, teachers, families and community members, to be named, Dani’s Dreams Outdoor Education Trail at Sugar Creek Park. NPHS AP environmental science (APES) students under the direction of Ms. Bennett will research, write and design signage as well as plan and lead activities for the trail. Ms. Rogler will provide curriculum, training and activities through Project Learning Tree. Initial plans were announced Nov. 4 at the Dani’s Dreams Family Tree Day event at Sugar Creek Park (photo gallery above). “The trail would have an overall theme of sustainability and should be a place the whole community can enjoy at any time to learn about the nature around them,” said Dani’s Dreams Outdoor Education Center director Donna Griffin. Bennett and her students will be the leaders for the development and implementation of the trail, integrating their work into the APES curriculum and Dani’s Dreams mission to encourage and support teachers in use of creativity in the classroom, to foster an interest in science and discovery with projects designed to develop an appreciation, responsibility and concern for the natural world. Community businesses, organizations, families and individuals who want to be involved in this innovative STEM education project, can contact Donna Griffin, dgriffins96@gmail.com or Brittany Bennett, brittanybennett@cscshc.org. “Community-based environmental education can also support opportunities for intergenerational learning. With these kinds of approaches, community residents from young to old can learn from each other.” – National Environmental Education Foundation Environmental Literacy Report, 2015. See what Dani’s Dreams is growing at Sugar Creek Park! 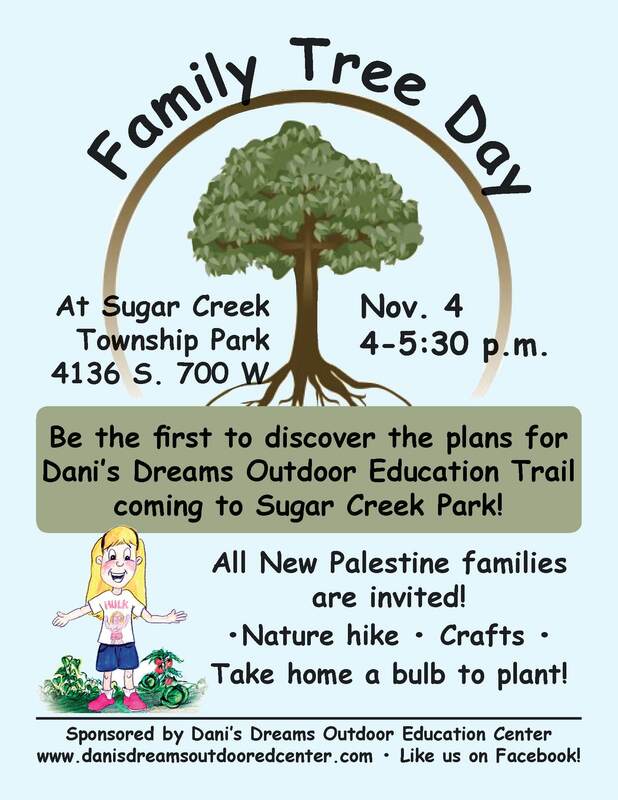 All New Palestine families are invited to Family Tree Day at Sugar Creek Park this Wednesday, 4-5:30 p.m. Join us for fun, outdoor education activities and be a part of the plans for “Our Common Ground.” Contact Donna Griffin at dgriffins96@gmail.com for more information. Stay tuned to http://www.danidreamsoutdooredcenter.com and the Dani’s Dreams Outdoor Education Center Facebook Page for more details. Three young artists focused their talents and will help Dani’s Dreams Outdoor Education Center “Change the World” at the eighth annual Memorial Walk/Run Aug. 1, 8 a.m. at New Palestine High School. Kate Taylor, seventh grader at Zion Lutheran School, took first place in the T-shirt design contest. Her design will appear on hundreds of T-shirts for race participants. Katie McKinley won second place design and Paige Taylor received third place; both are also students at Zion Lutheran School. Their designs will be on posters to promote the race. Events like Dani’s Dreams Earth Day Challenge, “Dig It” day, “Remember Our Roots” tree day, Children’s Museum Nights, Weird Animals presentations at VBS, and Girl Scouts Badge Days are only possible through the generous donations of Southern Hancock families, businesses and community members who support innovative education activities for our children. Click here to register for the walk/run or just to donate to help keep these events free to ALL Hancock County students. Next up, Dani’s Dreams will be developing the Butterfly Garden and adding a pavilion for the “Butterflies Up Close” project this August. Teachers and Scout Leaders who would like more information on how to be a part of the project (at no cost), email director Donna Griffin at dgriffins96@gmail.com or call 640-4430. Even if you can’t be there Aug. 1 for the walk/run, you can still register or donate and get a one-of-a-kind T-shirt. Groups of 10 or more who sign up can get their name on the back of the race T-shirts. Dream It – Do It! SciJinks is weather and Earth science made fun for all ages provided by NOAA and NASA. Change the World – Join Dani's Dreams Team! Help us Change the World!